A stylish open plan kitchen/living area with bi-fold doors opening onto a south facing slate terrace with outside settee & garden room. Oak flooring, kitchen with range cooker & American fridge/freezer. Parking for 2 cars, close to the village facilities & a short walk to the beach. This popular property has just had a major build and renovation - turning it into a stunning retreat that is sure to please. 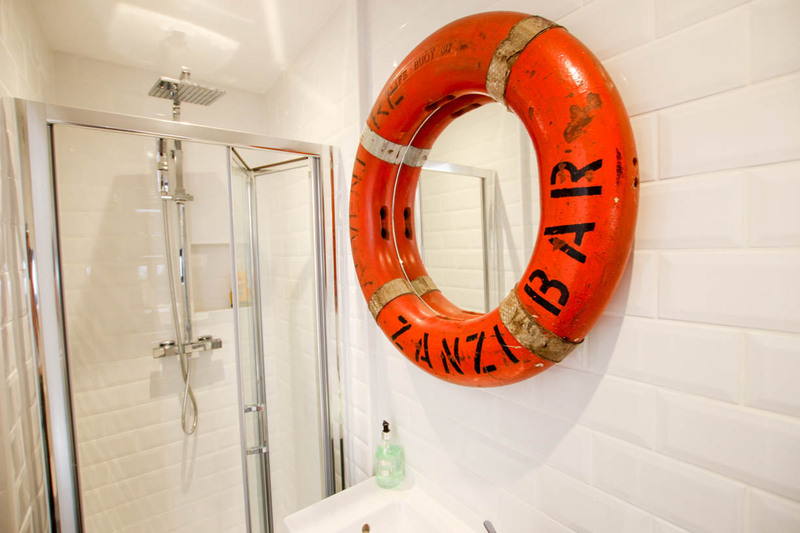 All the interiors have a real 'wow' factor and there are lovely 'surprises' throughout the property. Care has been taken to come up with comfortable and imaginative interiors that allow for an easy flow for groups and families, while still creating small individual spaces for relaxation. The property centres around a large open plan kitchen living room with a stunning double height ceiling over the living area and a mezzanine overlooking the space. The chef- quality kitchen is a well thought out space benefitting from granite countertops, a large Smeg range cooker and a double door American fridge freezer. The Belfast sink overlooks the garden and the island is clad with reclaimed wood from Indonesian wooden boats. All of the units have deep storage drawers with clever internal drawers to maximise the storage space in this well stocked kitchen. The living area is a lovely, bright and inviting space where the family can gather to plan their day and come together in the evening to share their experiences around the large table. 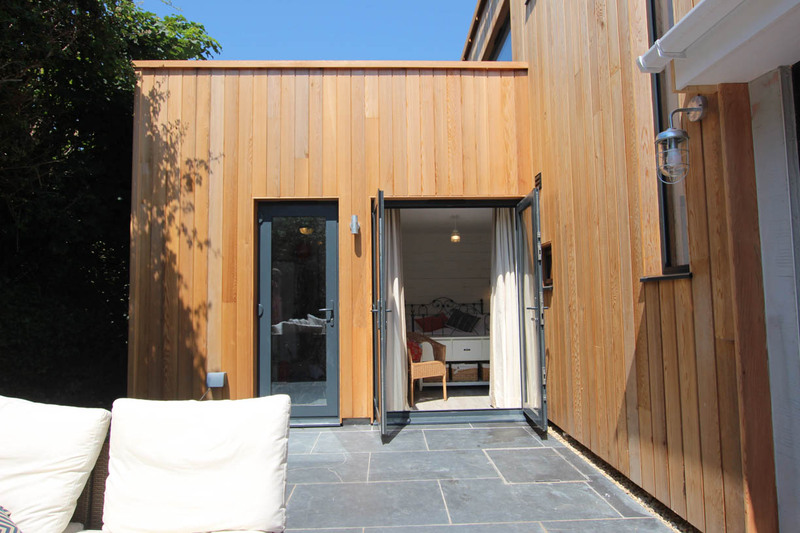 The bi-fold doors open straight on to a large slate terrace - providing real inside/outside living. 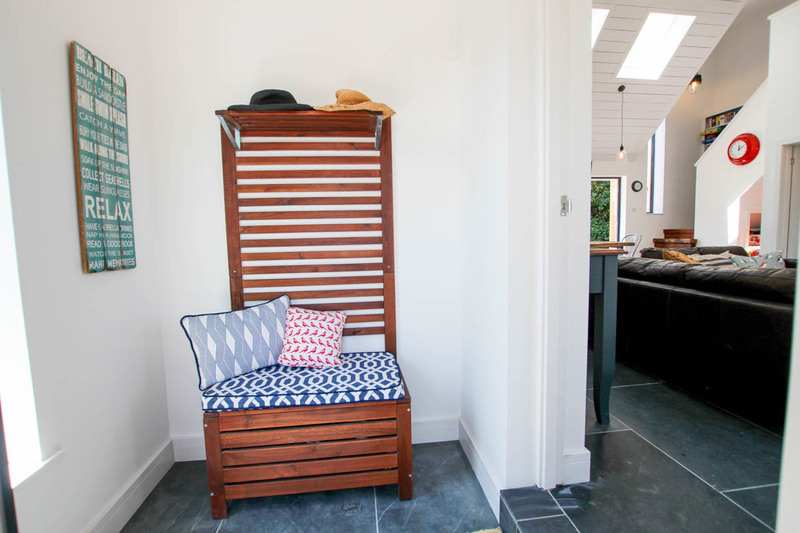 There is a large outside settee with comfortable cushions for relaxing at any time of the day and the clever contemporary garden room with a day bed, home office and bi-fold doors. When the doors are open on a bright and sunny day it further extends the living space - while offering quiet places to 'escape' and relax. The three sofas in the living room area provide ample and comfortable seating. There is a large TV cleverly hidden behind the surfing artwork for movie and TV viewing. 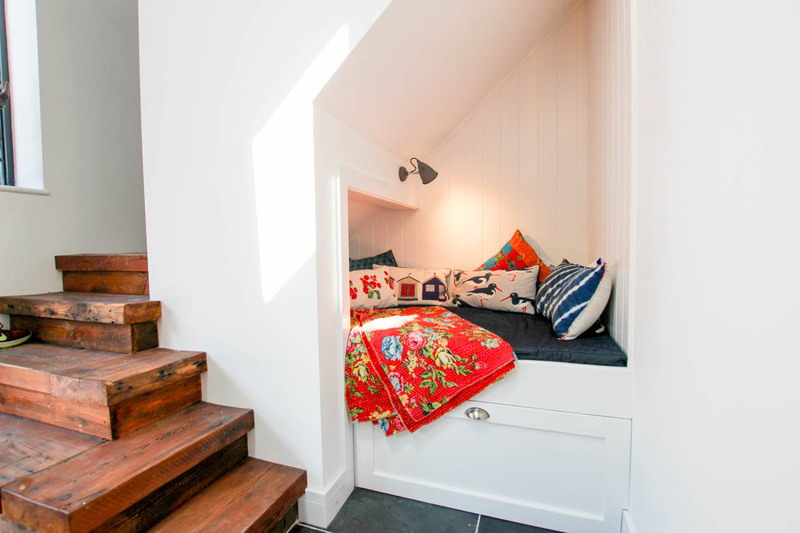 A little snug has been created under the stairs, with a light, to create a reading and relaxing area - creating a private space while still part of the group. 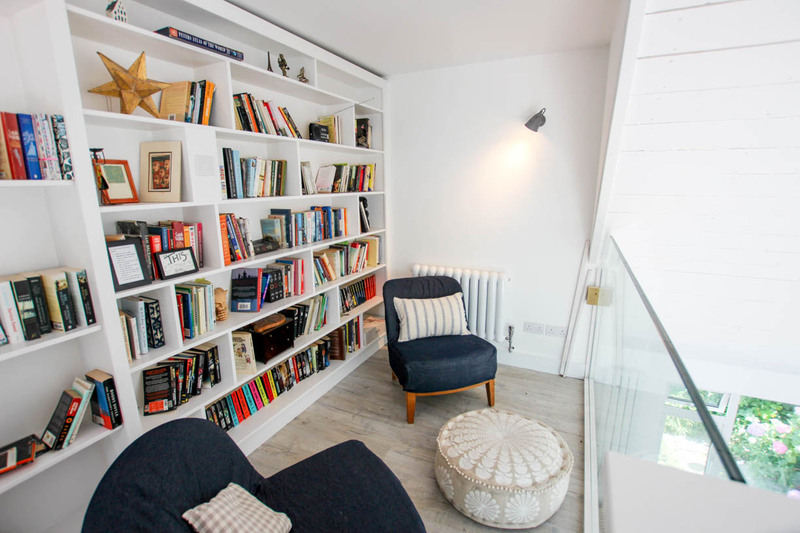 The statement staircase, with a bookcase (filled with books, DVDs and games for all ages) runs along the full wall, leading its way to a balcony mezzanine overlooking the open plan living area and providing an additional seating area. 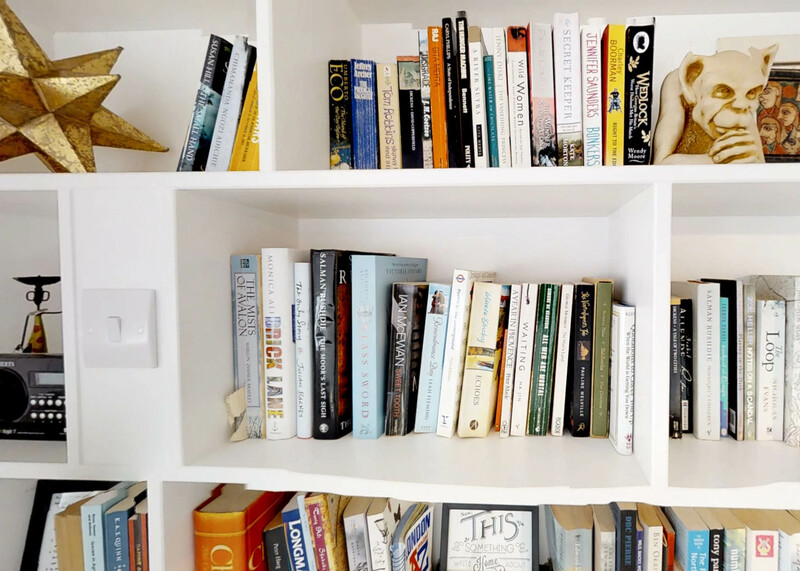 The bookcase is also sure to delight as it 'hides a secret'! A hidden doorway, disguised as part of the bookcase, leads into the impressive master bedroom, enjoying beautiful views overlooking the hills. The room also has a comfortable sofa and its own TV/DVD. 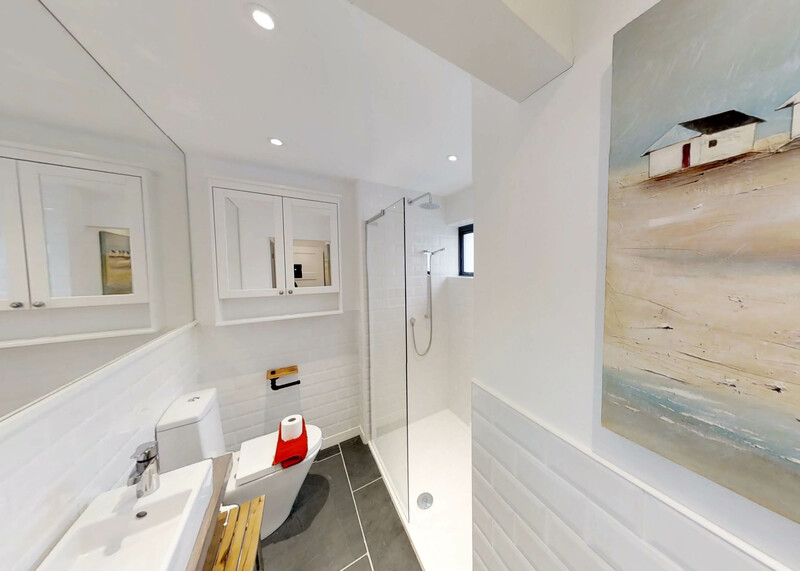 The open plan en-suite has underfloor heated slate tiles, a free-standing bath, extra-large shower, double sinks and an enclosed toilet. Three further bedrooms are found downstairs: The first room off the hallway (to the front of the property) provides sleeping for 3 guests with a single bed at the top and double underneath. 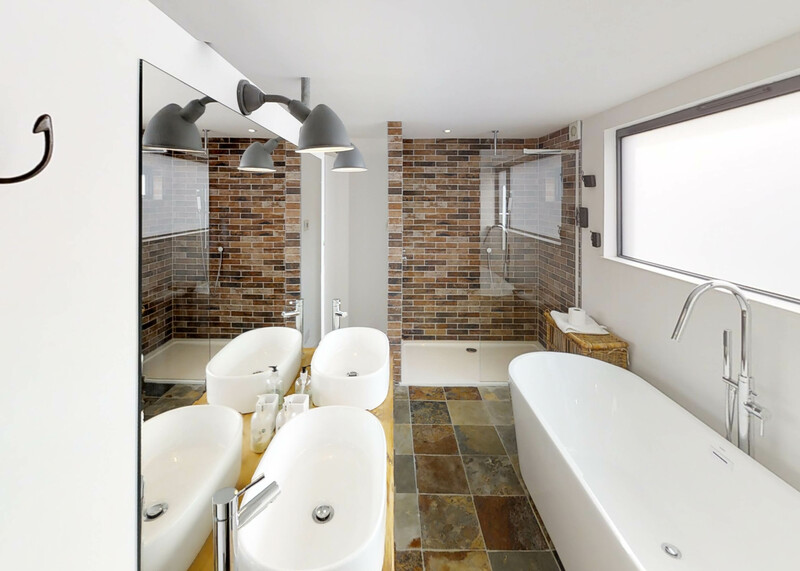 The next bedroom is a double room with an en-suite toilet and sink with underfloor heating. Both of these bedrooms have large closets for storage, contemporary and beautifully thought out interior design schemes and small TV/DVDs.. 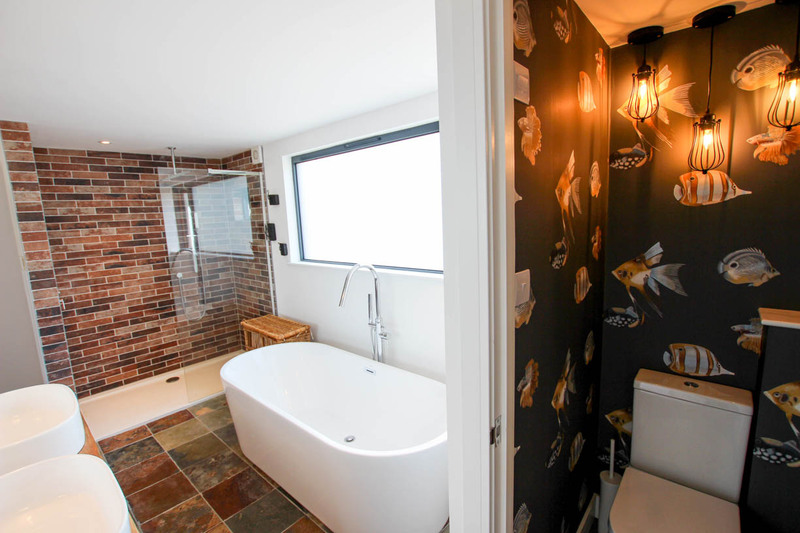 The family bathroom, found at the end of the hallway is bright with lots of storage and has a large walk in shower with both a hand held and wall shower options, shower stool and underfloor heating. 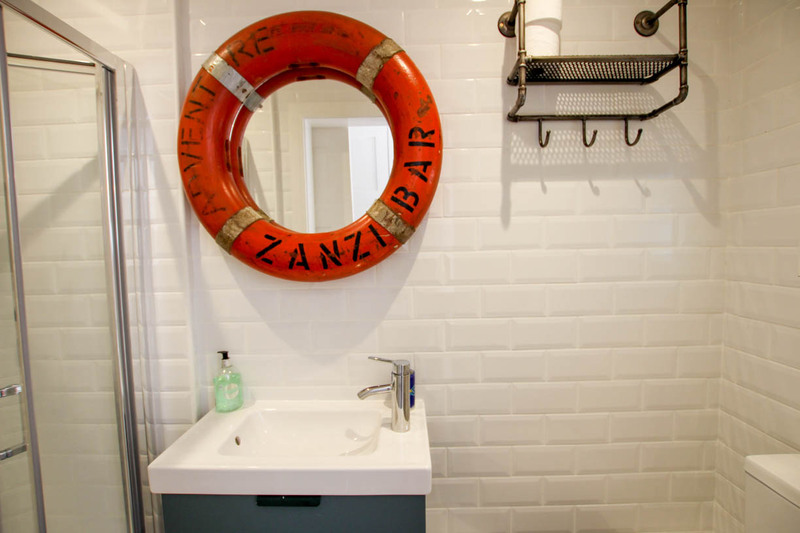 The final double bedroom has an en-suite shower, toilet, sink with storage and underfloor heating. 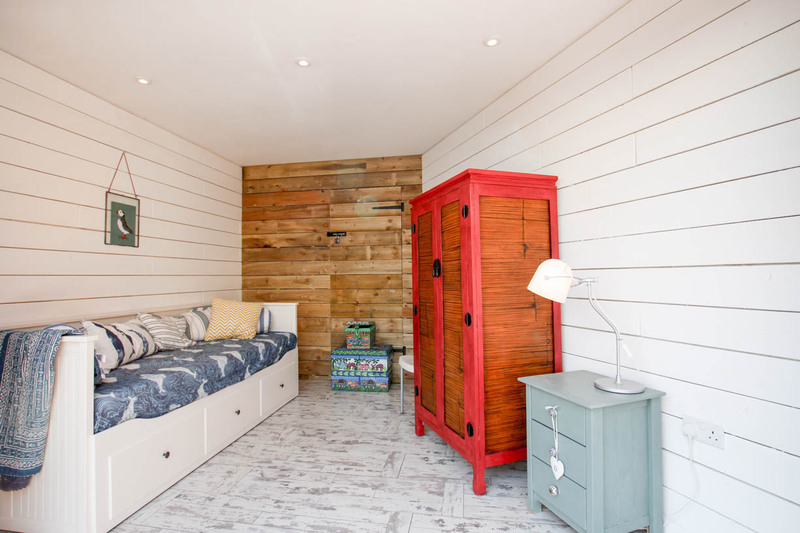 This calm and relaxing room cleverly mixes rustic charm with a comfortable iron bed has large closets and French doors that open onto the garden. The laundry/systems room - has a stacked washer and drier (with a pull-out folding table), small 'extra fridge' and additional storage. This room has been cleverly thought out with a fold out interior drying rack. The property is situated very close to the centre of this timeless village and has parking for two cars. 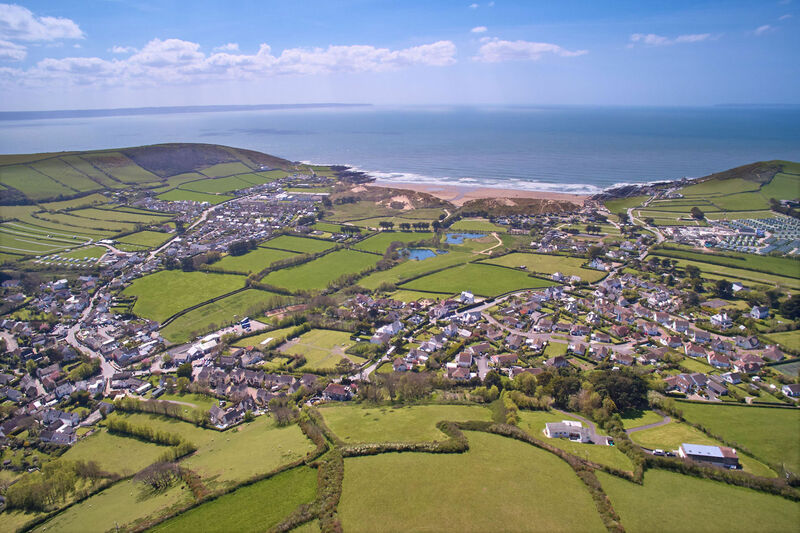 It is a very short walk to all the village facilities (including three public houses, bistro, ice cream and surf shops) and a short walk to the beach via a pretty footpath through the sand dunes. Thank you for allowing us to stay in this fantastic home. It has brought my family together for the first time in a while. We have really enjoyed ourselves and it’s also the first family holiday our baby bump has enjoyed. Many memories. Really well equipped house with great design and features. Very sociable living areas with lovely private bedrooms and bathrooms . Ten minute walk to Croyde beach, right in centre of village but very quiet. Would definitely book again.